Casa das Xaras is a spacious property (10 000 square meters), with a very quiet location and surrounded by the natural landscape of the Natural Park of Sintra-Cascais, and is a central point for exploring the regions of Sintra, Estoril, Cascais, Ericeira and Lisbon. NOTE: The property can be rented as a whole or partially. Partial rentals are possible (except in peak season) for the main area of the villa (living room, 3 double bedrooms, 2 bathrooms and kitchen) or for each of the suites. If rented partially, the garden and pool will be shared with the other guests. This cosy villa is ideally suited for relaxing and enjoying your staying, offering large open spaces, with a large lawn well integrated with a beautiful pool equipped with a deck and a barbecue. The villa consists of a large living room with fireplace and TV, 3 suites (double rooms with kitchenette and bathroom), 3 double bedrooms, 2 bathrooms and a fully equipped kitchen. There is also a small kitchen and a bathroom near the pool (available when the house is rented in its entirety). A propriedade está localizada na área de Sintra, num Parque Natural que permite uma excelente qualidade de vida, tanto para trabalhar como para lazer. In the rural area of Sintra but very close to the village, its location in a very quiet area, the good organization of the house divisions (all rooms have direct access to the garden) and its garden with very pleasant lawn and pool, provide an ideal spot for an enjoyable holiday. Its short distance from the village and the mountains of Sintra with its monuments and cultural landscape as well as from excellent beaches, equestrian centres and golf courses, allows you to optimally combine cultural activities with relaxing moments. 5 complete bathrooms, 3 of which may be used exclusively by the corresponding rooms, if these are rented separately. Adicionally, an ezra bathroom in the Pool House.. The main table in the living room sits 8 people (6 comfortably), and another table can be added with for 6 people. The kitchen has a table for 6 people and all suites have tables for 2 people. Roof terrace accessible from the garden. Main porch next to the living room, and three porches next to the bedrooms / suites. Avoiding smoking inside the house is much appreciated. Perfect villa for family or friends! I stayed at the villa with friends and three children for 7 days in May 2017. The villa is amazing, large, clean and homely. The garden is very big with pool area, BBQ and lots of green space. The owners are extremely accommodating and were always on hand if we needed anything. The villa is a bit off the beaten track in the heart of Sintra so I would recommend hiring a car as the taxi and Uber drivers found it difficult to find at times. Other than that, it was the perfect stay and I hope to visit again! Gemma and her friends made a lovely group that stayed for a week in Casa das Xaras. for a wedding in Sintra. They were very friendly and took very good care with the villa, leaving it in perfect conditions. It was a pleasure to host Gemma and her party and we look forward to hosting them again, or simply to have them visiting us in the future. 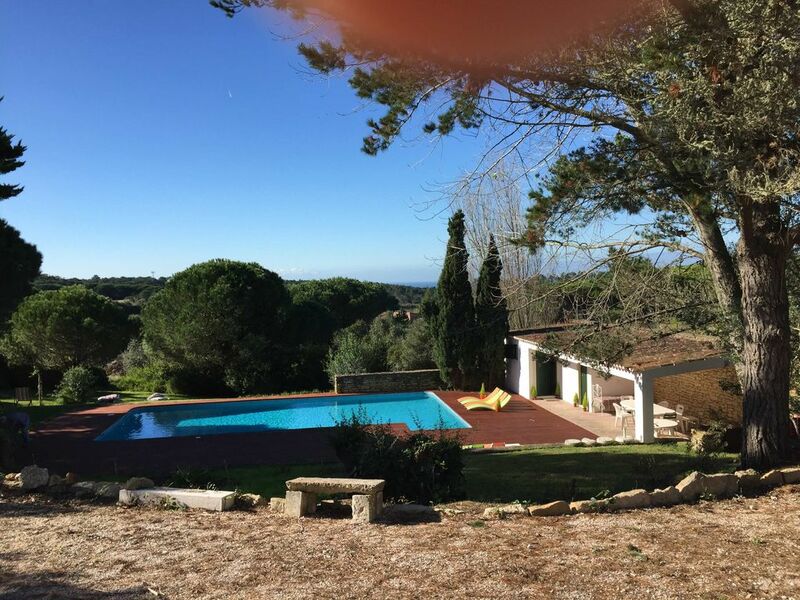 This is a truly wonderful house in a very private setting, close to Lisbon, just 15 minutes drive from the stunning hills of Sintra, and 10 minutes from the beach. The owners were very welcoming and greeted us with local wine, cheese, salami and fresh herbs for cooking. The facilities are spotlessly clean, the view from the many terraces spectacular. We have absolutely no hesitation in recommending this house. Très grande maison idéale pour un groupe de 12 personnes dans un cadre verdoyant avec une très belle piscine. Merci à nouveau à Pedro pour son accueil et sa disponibilité ! Corinne Noriega stayed in Casa das Xaras for an extended weekend with a group of friends. They were very kind and friendly and took very good care with the villa, leaving it in perfect conditions. It was a pleasure to host Corinne and her party and we look forward to hosting them again, or simply to have them visiting us in the future. Corinne Noriega est resté à Casa das Xaras un week-end prolongé avec des amis. Le groupe était très gentil et amical et a pris très bien soin de la villa, la laissant dans des conditions parfaites. Ce fut un plaisir d'accueillir Corinne et son groupe et nous espérons bien avoir l'opportunité de les accueillir de nouveau, ou simplement qu'ils nous visitent a l'avenir. Everything about this stay was excellent! The hosts were extremely good with communicating with us before the holidays and during! They answered all our queries and we never had to wait too long for a response. They were also very attentive with the check-in, ensuring we knew where everything in the house was and how everything worked. And it was also very helpful that they provided us with a 'welcome pack' showing the surrounding area and all the near restaurants and shops! The house itself was very comfortable and we had everything we needed for a comfortable stay. We were a group of 14 and everyone slept comfortably and there's more than enough bathrooms for all! The grounds are very well maintained with the house being perfectly located in a secluded area, but only minutes drive from civilisation! Definitely recommend this house for family units or groups of friends looking for a nice getaway! Thanks for the very encouraging review. We look forward to hosting you back sometime soon. Perfect place to be with your family. We enjoyed our stay in Casa Xaras very much. It was a pleasure to hosting you in Casa das Xaras, your comments and suggestions will be duly followed. Just 5 minutes away, Sintra, a UNESCO World Heritage Site (the first European Cultural Landscape in 1995) offers beautiful landscapes with stunning colours varying throughout the year, many historical monuments to visit and lovely places for shopping. Several typical villages can be visited nearby (Colares, Almoçageme, Azenhas do Mar, Gouveia, Fontanelas) offering restaurants and markets with excellent quality food (including fresh fish and seafood). The Cultural Landscape of Sintra provides a most suitable environment for various leisure activities, such as rural and mountain hiking, horseback riding, climbing and abseiling or yoga. Less than 30 minutes by car you can find several world-class golf courses (Penha Longa, Beloura, Quinta da Marinha, Oitavos Dunes Cascais, Estoril Golf Course, Fine) and equestrian centres providing riding lessons and horse riding (Paddock, Fontanelas, Quinta da Beloura). • Guincho (20 min drive), ideal for surfing and windsurfing, World Cup stage of Surfing and Windsurfing. • Beaches of Ericeira (30 min by car) also excellent for surfing and body boarding). • National Palace of Sintra - Erected during the Muslim rule on the Iberian Peninsula, with several changes under the reign of Kings Dinis, John I and Manuel I, keeping its silhouette from the mid-sixteenth century. • Pena Palace - The Park and the Pena Palace, deployed in the Sintra hills are the epitome of Romanticism of the nineteenth century in Portugal, with architectural references to Manueline and Moorish influence. • Moorish Castle - fortification built around the tenth century after the Muslim conquest of the Iberian Peninsula, and expanded after the Christian Reconquista it commands a unique panorama that stretches to the Atlantic Ocean. • Capuchin Convent - built in direct contact Franciscan convent with nature and according to a philosophy of extreme stripping architectural and decorative, small size and remarkable for the extreme poverty of its construction with extensive use of cork ('Convent of the cork'). • Monserrate Palace - one of the finest architectural and landscape creations of the Romanticism in Portugal, it combines Gothic influences, Indian and Moorish suggestions as well as exotic and plant motifs extending harmoniously to the lawns and botanic garden. The rates shown are for the whole property. To rent the property partially (only off peak and high seasons) either the main part (living room, kitchen, 3 bed rooms) or a single suite (see description), sharing the garden and pool with other guests, the rates applicable are: • main part : 60% of rates shown • single suite: 20% of rates shown Please contact the owner for further details.